Lookup filter is used to filter the values to be shown in lookup relation. Trigger.new : Returns a list of the new versions of the sObject records. Note that this sObject list is only available in insert and update triggers, and the records can only be modified in before triggers. Trigger.old : Returns a list of the old versions of the sObject records. Note that this sObject list is only available in update and delete triggers. Setup Audit trail is used to store the configurational changes. Where MyList is a List variable. Step 1: Generate Partner WSDL. Save the generated Partner WSDL. Step 2: Generate Apex code using the generated Partner WSDL. Copy the generated code and create a new Apex Class. In the generated code do the following changes. Change public partnerSoapSforceCom.DeleteResult delete(String ids) to public partnerSoapSforceCom.DeleteResult deleteSObjects(String ids). Change public partnerSoapSforceCom.UpsertResult upsert(String externalIDFieldName,sobjectPartnerSoapSforceCom.sObject_x sObjects) to public partnerSoapSforceCom.UpsertResult upsertSObjects(String externalIDFieldName,sobjectPartnerSoapSforceCom.sObject_x sObjects). Change public partnerSoapSforceCom.MergeResult merge(partnerSoapSforceCom.MergeRequest request) to public partnerSoapSforceCom.MergeResult mergeSObjects (partnerSoapSforceCom.MergeRequest request). Change public partnerSoapSforceCom.SaveResult update(sobjectPartnerSoapSforceCom.sObject_x sObjects) to public partnerSoapSforceCom.SaveResult updateSObjects(sobjectPartnerSoapSforceCom.sObject_x sObjects). Change public partnerSoapSforceCom.UndeleteResult undelete(String ids) to public partnerSoapSforceCom.UndeleteResult undeleteSObjects(String ids). Step 3: Creating a custom button ‘Share with Bangalore’. Step 4: Add the custom button to Account page layout. Step 5: Create shareWithBangalore apex class. Step 6: Add the field details in sobjectPartnerSoapSforceCom apex class. Add the below code in sobjectPartnerSoapSforceCom apex class. Step 7: Adding Remote site settings. In order to use apex code to submit the record for Approval process, we have to first create Approval process in Create --> Workflow & Approvals. 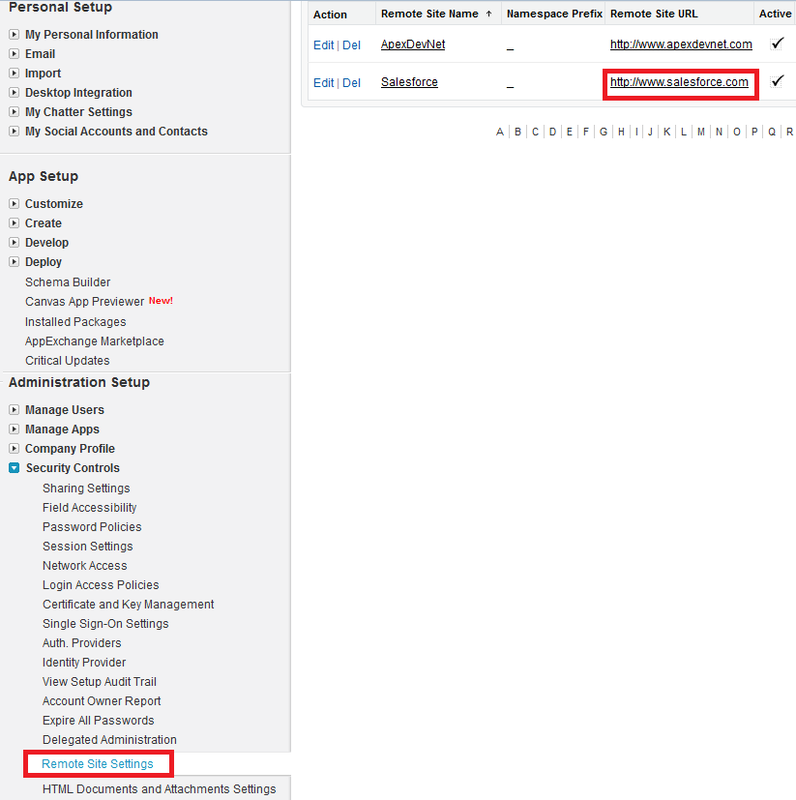 Dont forget to add "http://www.salesforce.com" under Setup --> Administration Setup --> Security Controls --> Remote Site Settings.